What about the tendon that hasn’t ruptured (yet)? As I’ve mentioned before my main concern now is the other tendon. Both sides have felt equally bad for years. Though apparently I’m unusual in that most rupture victims don’t have symptoms leading up to the event - I’d be interested to hear if that’s the case for others on here! Seth researches and lectures at Coventry and Leicester universities, and has a private practice in Nottingham which is only an hour or so away from me, so I gave him a call and booked in to see him. I found this really useful - he explained all the science and evidence behind what his current beliefs are in laymans terms that I could understand - drawing diagrams and using props to help explain. He also made ultrasound scans of both legs and tested my calf strength on both sides. One of the main things I’ve been told to do in the past (and what seems to be the conventional wisdom) is stretch the calf. I was determined to fix my issues so I was doing a lot of stretching. Apparently it’s not clear why this advice is given. 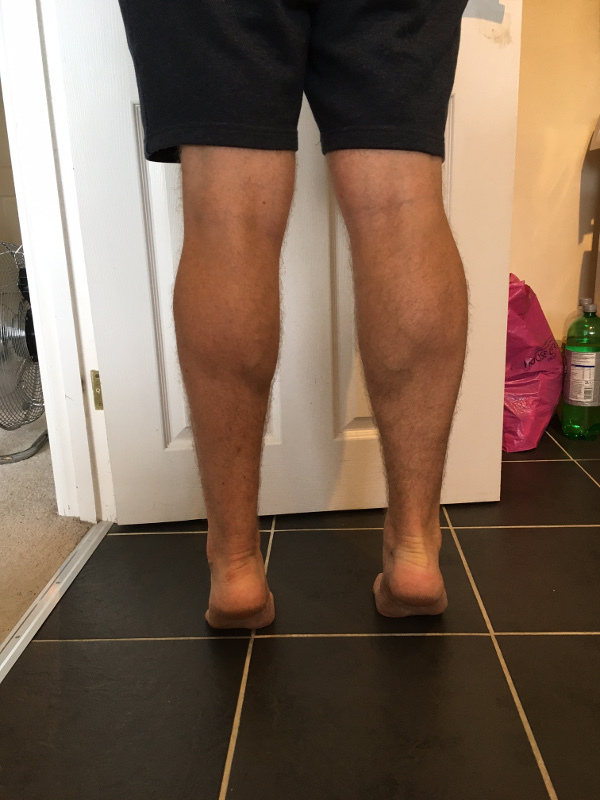 Seth went into a lot of detail about this but the main thing I came away with was, whilst the symptoms of Achilles tendinopathy might make the calf as a whole feel “stiff”, a damaged tendon is actually more “stretchy” than a healthy one. So it’s probably not wise to try and stretch it even further. Seth pointed out that studies have found a correlation between Achilles tendon injury and calf muscle weakness. For example, this study of army recruits during six-week basic training. In his own studies on runners he’s found that those with healthy tendons you can usually expect to be able to produce a force of 200% of their bodyweight through the calf (knee bent). Those suffering Achilles tendinopathy can be as low as 130%. When landing on the toes the calf muscle contracts in order to absorb the impact. What could be happening is that those with weaker calf muscles are unable to absorb this impact as effectively, meaning the tendon has to take more of the strain. For this reason he prescribes calf strengthening exercises, which basically means weighted heel raises. Bodyweight is probably not enough to have an adequate strengthening effect (he suggests buying 25kg bags of sand from DIY stores and putting them in a backpack - much cheaper than a gym membership). For me he prescribed heel raises with isometric holds and various points throughout the range of motion, more info on this in the podcasts above and articles below. For the same basic reason - completely resting is also a bad idea. 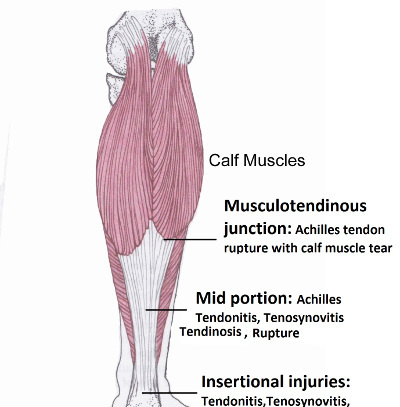 The muscle and tendon need to be loaded in order to stay strong and healthy. The ultrasound scans showed that the left achilles is healing well. He showed me the site of the rupture and the damage but the scan showed it is healing as well as it feels like it is. 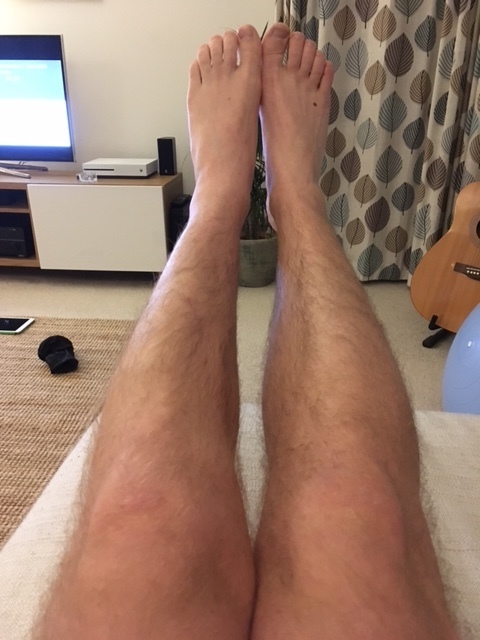 Whilst setting up for the scans he also noted that there was a good level of resistance when he went to brace my foot for the scan, as in the tendon has healed at a good short length. I’m really glad my physio was adamant about me not stretching in the earlier weeks. Seth basically confirmed that I’d been given good advice throughout my rehab. The other tendon (the one I was really interested in) actually didn’t look too bad. He showed where there is some damage (it was exactly where he predicted it would be based on where I feel pain) but it’s far from the worst he’s seen. I’ve been doing the rehab exercises on both sides so maybe this plus the forced rest from vigorous activity has helped it to heal? I hope so. I don’t want to go through this again on the other side! In terms of strength testing - he predicted that because I’ve done a fair bit of strength training in the past - I’d probably come out better than the 130% of bodyweight that he observes in runners with these issues, but less than the 200% that he’d see in healthy runners. Conveniently I weigh around 100kg so he was expecting somewhere between 130kg and 200kg of force. Exactly right. On the right-hand side I was at about 180kg and on the left (ruptured) side I managed 140kg (which apparently is OK 6 months after rupture and another indicator that it’s healing pretty well). In a way I was disappointed that the right-hand side wasn’t lower, as that would finally give me an obvious reason for all these Achilles problems, but given the studies were on runners with likely very slight builds I guess I should really shoot for a way above 200kg. It’s worth a try anyway! It’s exactly 6 months since I snapped my left Achilles, and over 3 months since my last post. It’s true what others say here - once you get through that initial phase - life gets largely back to normal and progress is gradual, so it feels like there’s not a lot to report. 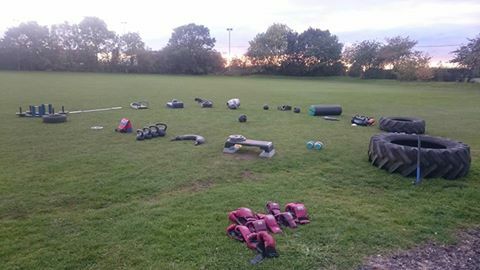 That said - I went to my mate’s outdoor circuits session 2 days ago, which is a milestone I’ve been looking forward to for a long time. It’s the first time I’ve been back to doing physical stuff that I actually enjoy (though I’ve learned to appreciate walking a lot more than I did). I’m still avoiding running/jumping but that didnt’ stop it feeling like a proper workout given how much my fitness has dropped. I did previously try and go back to the gym, but I couldn’t bear the feeling of being one of the silent hamsters in a room of wheels. So I’d been trying to do a few “moves” akin to circuit training in my living room at home, to the amusement/annoyance of my girlfriend. I can do a handful of single leg heel-raises at a time now, which still feels incredible given the muscle wasn’t attached a few months ago. I think I have roughly the same amount of mobility in both sides now too, despite never really doing any “stretching” exercises. The bad one still feels different, tighter. There’s still a big old palpable lump of scar tissue in there. I think I’m doing well overall. I attribute this to a combination of luck (no complications), being given the right treatment, the right advice, and acting on it. I have to thank the NHS, and the staff at Warwick Hospital (especially my physiotherapist) for this. (As well as achillesblog members of course ;)). Now I can make a start on losing the 7kg of timber I’ve gained elsewhere since the rupture. In a selfish way it’s good to know this injury can happen to the pros as well. I was closely following David Haye’s story after he suffered a full rupture in the ring at the weekend. I certainly didn’t carry on for 5 rounds - I just sat down and tried not to puke. I couldn’t resist watching the slow-mo replay, still makes me cringe though! Monday was my third physio session. So I was 3 weeks cast + 5 weeks boot + (nearly) 3 weeks in 2 shoes (non-op). She had a look at my walking and straight away commented that I was “blocking”. I think this basically means limping where I stop and jerk expecting pain to arrive. She also noted my shoulders were tense as I walked, probably for the same reason. She got me to try to walk with smaller steps and to try to relax my shoulders, which worked - just made me slower. I’ll have to just try to step faster instead to make up for it! She also pointed out I wasn’t extending my knee fully on the bad side - which we established was the same thing - me trying to stop before I feel pain. Again walking with smaller steps and trying to remember to extend the knee should help. Since then I’ve tried to feel what I do with the “good” leg, and realised I sort of can’t remember how to walk “normally” any more! I wonder if I’m also keeping my knee bent because that’s what I did in the boot to overcome the height difference. 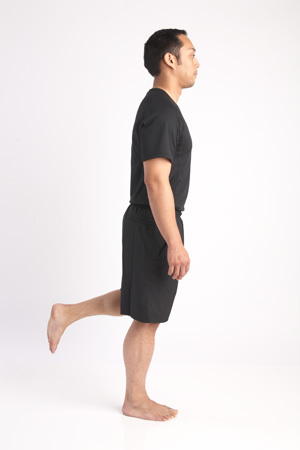 I looked at some videos of people walking but it seems that knee extension varies between different people. Some seem to keep the knee bent (top) whilst some look fully extended through most of the step (bottom). I asked here before about massaging the lump on my tendon. I actually rang the fracture clinic and they’d said it was fine (though I was sure I wasn’t talking to someone clinical!). I’d had my girlfriend dig into my soleus a bit, and it did feel better afterwards. I mentioned this to my PT and she said that as I still shouldn’t be massaging the tendon itself. It will make it feel better apparently, something about triggering pain receptors and releasing endorphins, but that doesn’t mean it’s a good idea! She palpated the back of my leg and did make a face implying “oh yeah that’s quite a big lump” when she got to the tendon, and found it was very tight around where the tendon meets the soleus a little bit further up (but lower than I thought it would be - around the very bottom of the thin red bits on the image below). This is actually the bit that hurts to palpate, and apparently is fine to massage here, it’s just muscle tightness. Maybe I mis-heard and it’s not that we can’t massage the Achilles so much as the rupture site specifically. As before my ankle ROM is the same as the good side except in dorsi-flexion, which is still a few degrees over neutral. My PT had a good squeeze around my foot and found I was really locked up between the 2nd and 3rd meta-tarsals (so above the middle of the inner arch). She described why she thought that was and it makes total sense to me. When I’ve been walking I try to lock my foot and ankle rigid as I roll towards the toes, again to prevent it dorsi-flexing and triggering pain in the tendon. Sort of imitating walking in the boot again I guess. So I need to try and relax the foot more and let it push off naturally. I mentioned that I’ve been experiencing good days and bad days, and she pointed out that I need to be doing my physio exercises little and often, not in great marathons at the end of the day like I have been! She asked how I’ve been getting on with this. I’d been building up and was at 3 sets of 20 seconds. Ideally she wants me to build this up to a minute. This morning I managed a whole 2 minute electric toothbrushing session on the bad leg so that’s gone well! She also asked about standing on one leg with my eyes closed. I can barely do that on the good leg I’m going to work on that too, but it’s too early for the bad leg. The good leg I can do 20 seconds on a good day. Whilst she wants me to take short steps for general walking, she asked me to practice a few long steps at home as part of my physio routine. I think mainly to get over the rigid foot/blocking issue. She demonstrated this to me - I’d actually say it’s almost like a lunge-walk, just not as deep. I do also get a bit of pain as I near the top of the heel raise on the bad side, though that comes and goes. Overall she seemed pleased with my progress. I mentioned that I’ve put back over an inch of the 2 inches that I lost on the calf, which apparently is good going at this stage. She asked me to book in in 10 days time since I’m doing quite a lot on it now. It’s now 10 weeks since the incident (feels like more, Christmas was ages ago!). So I had 3 weeks in a cast, 5 weeks in a boot, and now 2 and a bit weeks in 2 shoes. I mentioned before, these last 2 weeks have been a bit harder than I expected. Whilst the boot is a pain, especially to sleep in, you get used to being pain free, mobile and “safe” in it. 2 shoes does feel like a bit of a step backwards to begin with. 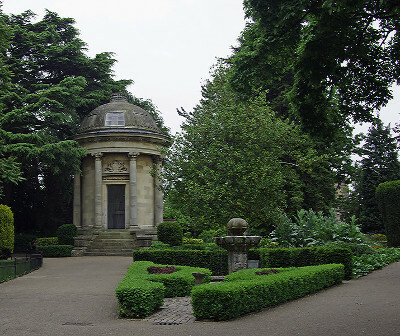 I’ve learned to really appreciate the Victorian era gardens over the road from my flat. This is where I go to stretch my legs at lunchtimes, and every day I try to go a bit further so I know I’m making progress. 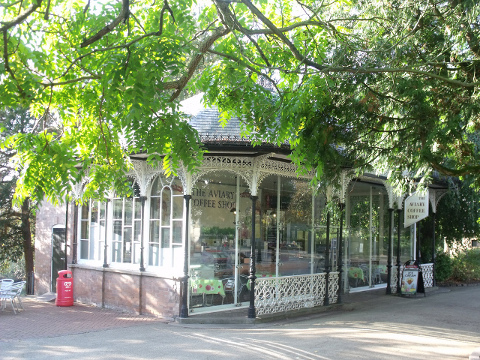 There’s also a cafe in the middle I go to in order to have a bit more human contact whilst I’ve been stuck at home. When I first went out in two shoes (with a crutch) I could only make it to the first bench in the gardens. I could see the cafe in the distance but there was no way I could make it. The next day I put my boot back on, but it was very uncomfortable because my leg was now swollen and hurting, whereas before I could go miles on it. I failed to get to the cafe again. This was pretty disappointing. Over the next few days I switched back to two crutches (I really didn’t want to go back to the boot). I pushed on to the cafe one day and found that the next I couldn’t make it again. Progress wasn’t linear like it was in the boot. I did notice that the “bad” days were always damp, grey days, so maybe I could blame the weather. One weekend I got my girlfriend to carry my crutches for me and I managed to walk quite a chunk of the way to the cafe, but the next day it was like I’d gone back a week. I started to worry that I was lagging behind on my progress. I remembered that Don from here is a couple of weeks ahead of me and talked about walking miles after 2.5 weeks. At 2 weeks this didn’t seem likely. However, the day after I finally let my girlfriend massage into the big lump I can now feel on my tendon, I felt a marked improvement. (Fortunately for me she’s just qualified as a soft tissue therapist, I can honestly recommend her!) In the last couple of days I’ve really come on. I take a crutch out with me but find I can just carry it and wobble along for a reasonable distance. I still seem to waddle side-to-side a lot but it doesn’t feel anywhere near as sketchy as before, and I can brace my ankle as I roll through to the toes without feeling pangs of pain or discomfort. This morning I even drove myself to get my hair cut, and it felt fine. The feeling of freedom is a hell of a buzz. I see my physio again on Monday. Last time she was keen that I still wasn’t to do any stretches, and she hasn’t given me anything like heel raises to do yet. Whilst I’ve only seen her twice I feel reassured that she knows what she’s doing. I’m looking forward to seeing what happens next. Week 10 Day 1 - Scar Tissue? I’ve started to really notice a palpable lump on the inside (medial side) of the tendon at about the height of my ankle bone, about the diameter of a grape and fairly firm but painless. It seems to disappear up into my leg when I point my ankle down (plantar flex). I guess this is a ball of scar tissue on the tendon. I haven’t been told to massage anything yet so I’m going to resist the temptation to poke at it! Week 9 Day 1 - 2 ShOES YEAH! …and I can sleep without the boot. Over the moon! 4 days later, what’s up with my right arm! Last day before I go back to hospital. I’m booked in to see the consultant followed by the physio, so I guess things will start happening now. The safety of the boot is nice but it does feel like time to move on. I know from blogs and videos here that I need to be pretty careful with it at this stage. That said it seems it’s mostly just pot luck as to whether you’ll be one of the 8-20% (depending on who you believe) that land on the snake and go back to square 1 (i.e. suffer a re-rupture). If that happens, I’ll just have to deal with it. I really hope they tell me I can sleep with the boot off. I haven’t slept well for at least 3 weeks. I’m not sure why as I’m sure I slept OK at first. Now I just wake up after a couple of hours and can’t find a comfortable position with that great lump on my leg. I’ve got used to how small my left calf looks now when I take the boot off. There’s still a bit of muscle on the outside calf (lateral gastroc head) but the inside (medial) just seems to have disappeared. Last time I checked it had lost 2 inches compared to the good side, maybe a bit more now. I’m definitely looking forward to getting the green light to try and lift some weight with it, though I guess I shouldn’t get my hopes up! I bloody love wedge day! I think because it’s a milestone to tick off on the road to recovery. I went through the whole top or bottom trial process again and ended up removing the bottom wedge (wedge 4 of 5). This leaves wedges 2 and 3. Fairly uneventful really, it’s still comfortable enough and I can still get about without crutches. morcs has completed the grueling 26.2 ATR miles to full recovery!